Idlib city fell on 28 March out of Assad regime hands to a rapid Syrian rebel offensive that included heavy reliance on two jihadist factions: Jabhat al-Nusra (Syria's al-Qa'ida affiliate) and Jund al-Aqsa (a group founded as a neutral third way between the Islamic State and Jabhat al-Nusra, primarily operating in Idlib and Hama governorates). This was part of an alliance known as 'Jaysh al-Fath' (Army of Conquest). 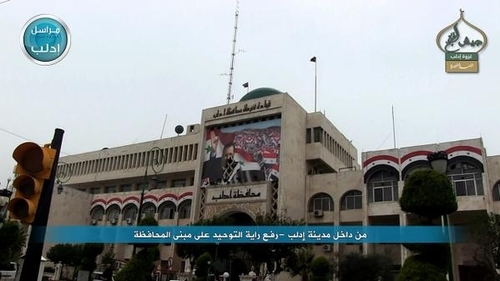 Both Jabhat al-Nusra and Jund al-Aqsa have not hesitated to advertise their presence in the city since its fall. The real question now is how these factions will compete with each other for influence in the city in the long-run. Though Ahrar al-Sham, the most important mainstream rebel faction (hardline Salafi) to participate in this offensive, has generally steered clear of open confrontation with these jihadist factions, there are reservations about Jabhat al-Nusra's approach to governance in particular, which has become less compromising in aiming to monopolise control of institutions like the judiciary. This partly explains Ahrar al-Sham's recent absorption of Suqur al-Sham : counter-balancing Jabhat al-Nusra's growing power in Idlib province, even as the two work together on many military fronts. From Jund al-Aqsa's Twitter feed: "Views of conquest: Martyrs' Square after its liberation in the city of Idlib." 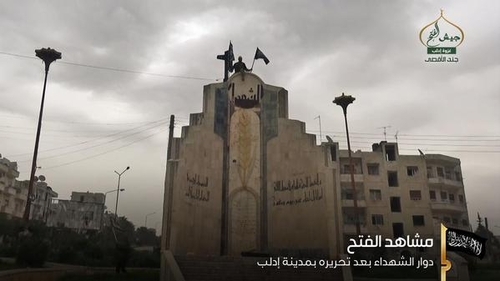 From Jabhat al-Nusra's Idlib province feed, claiming to raise the 'banner of tawheed' over the provincial building, presumably their own flag.